Today’s Friday sermon was about the phenomena of solar and lunar eclipses and their historical significance as regards the advent of the Promised Messiah (on whom be peace). A solar eclipse took place in the UK today and also in some other countries. The Holy Prophet (peace and blessings of Allah be on him) instructed to particularly pray, engage in istaghfar, give alms and offer Salat during eclipse. Today special Salat known as Salatul Kusoof [Kusoof is solar eclipse] was offered by the Jama’at in areas of solar eclipse in accordance with the Sunnah of the Holy Prophet (peace and blessings of Allah be on him). Ahadith tell us that solar and lunar eclipses are special signs of God and according to the Holy Prophet (peace and blessings of Allah be on him) they were a great sign of the advent of the Promised Messiah. And indeed eclipses of the sun and the moon were witnessed in the West as well as the East in corroboration of the Promised Messiah (on whom be peace) which makes them very significant for the Jama’at. Today’s eclipse was not a sign of the advent of the Promised Messiah but it certainly draws one’s attention to the eclipse that took place during the advent of the Promised Messiah (on whom be peace). It also makes it significant because it occurred on a Friday and Friday is particularly attributed to the advent of the Promised Messiah. The eclipse has also taken place in the month of March three days prior to its twenty third day; the date when the Promised Messiah (on whom be peace) made his claim. The Holy Prophet (peace and blessings of Allah be on him) gave particular significance to solar and lunar eclipses. There are Ahadith regarding an eclipse that took place in the life time of the Holy Prophet (peace and blessings of Allah be on him). Hazrat Asma (may Allah be pleased with her) related: ‘I came to ‘Aishah during solar eclipse and saw her Praying. I asked her what is wrong with the people that they are Praying at this hour? She gestured with her hand towards the sky and said: SubhanAllah. I asked her is there a sigh and she nodded in the affirmative. So I too stood and Prayed until I swooned and poured water on my head. 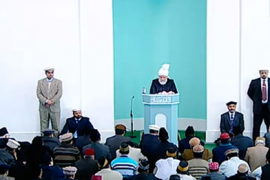 After the Prayer the Holy Prophet (peace and blessings of Allah be on him) praised and glorified God and said: Just now I have seen something which I never saw before…including Paradise and Hell. It has been revealed to me that you will be put to trials in your graves… You will be asked: What do you know about this man? A believer will reply, He is Muhammad, the Prophet of God and he came to us with self-evident truth and guidance and we accepted his teaching, believed in him and followed him. The person will be told, sleep peacefully as you were surely a firm believer. On the other hand a hypocrite will reply: I do not know but I heard people saying something so I said the same.’ The Holy Prophet (peace and blessings of Allah be on him) also said: The sun and the moon do not eclipse because of someone’s death or life but they are two signs amongst the signs of Allah, so Pray whenever you see them. The Promised Messiah (on whom be peace) wrote about the prophecy of solar and lunar eclipse: ‘I am very much surprised that although sign after sign continues to appear, the Maulawis are least concerned with the truth. They do not realize that God Almighty causes them to suffer defeat in every field. How they wish that Divine support of some sort or other should appear in their favour also, but, instead of support, their failure and frustration continues to become apparent with each passing day. For example, during the days when the almanacs were widely reporting that both the sun and the moon would be eclipsed in the coming month of Ramadan, many people had begun to think that perhaps this was the sign of the advent of the Promised Imam. This caused the Maulawis to fear lest people should incline towards me, for I was the only one claiming to be the Mahdi and the Messiah. In order to conceal this sign, some of them began to proclaim that the eclipse of the sun and the moon would not take place in the coming month of Ramadan, and that it would only take place when their Imam Mahdi appeared. But when the eclipses of the sun and the moon did take place in the month of Ramadan, they started making excuses and saying that these eclipses were not in conformity with the words of Hadith, because the Hadith says that the lunar eclipse would take place on the first night and the solar eclipse on the middle of the month, while in my case, the lunar eclipse took place on the 13th night and the solar eclipse on the 28th of the month. But when it was explained to them that the Hadith did not mean the first night of the moon, as the moon of the first night was not called Qamar, but Hilal, and the Hadith contained the word Qamar and not Hilal. Therefore, what the Hadith meant was that the moon would be eclipsed on the first of the nights during which lunar eclipse can possibly take place, i.e., 13th night of the moon, and the sun would be eclipsed on the middle one of the days in which it can possibly take place, i.e., the 28th. Hazrat Ghulam Muhammad Sahib said that during his adolescence there was a Maulawi Sahib called Badr ud Din in his village. He remembered being with him when the eclipse occurred and Maulawi Sahib said SubhanAllah this is a sign of the Mahdi. Maulawi Sahib accepted the Promised Messiah (on whom be peace) and worked assiduously on his family for a year after which they also accepted Ahmadiyyat. Hafiz Muhammad Hayat Sahib writes that after the eclipses of 1894 people became very keen that the Mahdi must have appeared and the Day of Judgement must be near. People were perturbed and there was much talk on this subject. Some elders decided to walk to Qadian to see the Mahdi in person and if all signs were fulfilled in him they would take his bai’at. They were Sheikh Ameer Din Sahib, Mian Muhammad Yaar Sahib and Sahib Din Sahib. They had very little money on them. It was nearly time for harvest of wheat and they would ask farmers for some ears of wheat to eat. After days of travel when they reached Batala students of Maulawi Muhammad Hussain Batalwi told them that the claimant of Messiahship was God forbid a liar and had made not one but seven claims. They told the travellers to return home. Ameer Din Sahib though uneducated, said: even if he has made seven claims he is still truthful. He is going to go on to make many more claims. If I were to wrestle with seven of you on my own and thrashed you, I would prevail over seven of you. Imam of the age has to contend with all the religions of the world and he is going to make many more claims. They carried on with their journey and reached a tea stall run by a Sikh. They told him about Maulawi Muhammad Hussein’s protégés and he expressed dismay. He told them the way to Qadian and said he knew Mirza Sahib. When the travellers reached Qadian the Promised Messiah (on whom be peace) was in Masjid Mubarak with a gathering of people. He was conversing with the people as well as writing something and the conversation did not disrupt the fluency of his writing. It was as if the subject-matter was coming to him from an unseen source. When they told the Promised Messiah (on whom be peace) about Maulawi Muhammad Hussein’s students, he remarked how well an uneducated person had responded to them and said that indeed God had taught him what to say. The travellers stayed three days in Qadian and experienced everything first hand. They went to the mosque and give the Promised Messiah (on whom be peace) greetings of the Holy Prophet (peace and blessings of Allah be on him) and took bai’at. Qureshi Sahib writes about Hazrat Qazi Akbar Sahib that he belonged to Ahle Hadith community. After the solar and lunar eclipses he realised the time of the advent of Mahdi was close. Following the eclipses discussions took place and Qazi Sahib said we should look for the Mahdi. The task was assigned to some people who found a few books for Qazi Sahib to read. He had seen in a dream prior to receiving the books that he is given three books. Something foul emerges from the first book so he throws it away but the other two books emit light. The dream was fulfilled in that the first book he decided to read was a refutation of the Promised Messiah’s claim. He abandoned reading it after coming across hurtful remarks in it and he found the other books as he had seen in the dream, full of light. He sent a group of people to Qadian who took bai’at. This group was also deterred by people of Maulawi Muhammad Hussein Batalwi from going to Qadian by making false and wicked assertions, but they carried on. Later on, Qazi Sahib first took bai’at by post and then in person. After the solar and lunar eclipses occurred Qazi Maula Baksh Sahib mentioned them in detail in a sermon and said these were signs of the advent of the Mahdi. He said we now have to wait and see when and where the Mahdi appears. This sermon had far-reaching impact on people. Although Qazi Maula Baksh Sahib did not accept Ahmadiyyat but his son Hazrat Mian Imam Din Sahib studied Ahmadiyyat and then took bai’at. Hazrat Ghulam Mujtaba Sahib writes that he read Durre Sameen (book of poetic compositions of the Promised Messiah) in 1901 when he was employed in Hong Kong. The world situation was crying out for a reformer. Reading Durre Sameen he felt if its writer was truthful it was something most auspicious or else he was an excellent liar. Later he also read the Promised Messiah’s book Izala Auham at length. He also held discussions with the Imam of the mosque in Hong Kong. He says when the solar and lunar eclipses took place his father had said the Mahdi has been born. Hazrat Maulana Ibrahim Bakapuri writes that a father and son went to a Maulawi and asked him if the hadith of the solar and lunar eclipse was true. The Maulawi replied the hadith was true but warned them ‘not to fall in the entrapment of Mirza Sahib’ because he was citing the hadith for his claim. He said the hadith was about the birth of the Mahdi and was not a proof of claim. The father said you have given me the answer I needed, as for what the hadith is applicable on, I have spent a lifetime in law courts but the government never asked me to bring witnesses unless I first made a claim. Mirza Sahib’s claim is from before and the solar and lunar eclipses have taken place in corroboration of his claim. Later the father and son were enabled to take bai’at. Hazrat Sayed Zainul Abideen Waliullah Shah Sahib writes that it was widely held in those days that Muslims were ruined. It was the end of the thirteenth century [Hijrah] and it was said that Imam Mahdi was going to appear and Hazrat Isa (on whom be peace) was also going to appear after him. My dear mother used to mention Imam Mahdi and Hazrat Isa delightedly and would say that solar and lunar eclipse was specific to the advent of Imam Mahdi. After the eclipses occurred God enabled the entire family to take bai’at. Mirza Ayub Baig Sahib writes Ahadith gave solar and lunar eclipses during Ramadan as a sign of Imam Mahdi. When days to the occurrence came closer in 1894 both brothers headed for Qadian. They first reached Batala. The eclipse was to occur the following day. The weather was inclement and its severity meant the even walking was difficult. One could only see the path when lightning struck. But they were determined to reach Qadian that night. They prayed most tender-heartedly for the weather to calm down entreating that they were going to see the Messiah. Soon after the wind changed direction and headwind became tailwind and helped them on their way. After some time they decided to get some sleep and slept by the wayside. The weather was clear when they awoke. They took their sehri at the food spread of the Promised Messiah and they were enabled to offer Salatul Kusoof behind the Promised Messiah (on whom be peace) in the morning. The eclipse appeared quite partial at the start and the Promised Messiah (on whom be peace) was concerned that owing to it being so partial people would not able to observe such a magnificent heavenly sign. Later most of the sun was covered by a shadow and the eclipse could be clearly seen. Maulawi Ghulam Rasool Sahib writes I was in Lahore when the 1894 eclipses took place. The clergy was quite perturbed and this had an impact on me as well. The Maulawis felt that the true heavenly sign was going to have a very positive effect on people regarding Mirza Sahib. Hafiz Muhammad Sahib of Lakho had come to Lahore for medical treatment. I also went to see him. People asked him that he had written about this heavenly sign very clearly in his book and now that it had occurred and Mirza Sahib had called it a sign for him what did the Hafiz think? He replied he was feeling quite weak and frail and could only answer after his recovery. Meanwhile he said he would ask his son to desist from opposing Mirza Sahib. Maulawi Ghulam Rasool writes that although in his heart he was convinced of the Promised Messiah’s truthfulness he did not take bai’at until after a few years. Bhai Abdul Rahman Sahib writes that he was in Year/Grade 8 when the solar eclipse of Ramadan 1894 took place. The headmaster at his school declared that Imam Mahdi should be searched for because his sign had been fulfilled. In spite of making this announcement, the headmaster did not accept the Imam Mahdi. Bhai Abdul Rahman Sahib did not have any knowledge about Imam Mahdi but did not feel comfortable asking his teachers. So he asked his class fellows and after listening to their opinions he had the following five-point view on the solar and lunar eclipses of 1894. 1. A phenomenon foretold 1300 years ago which was fulfilled with precision. 2. It was a phenomenon beyond human efforts and was entirely from the heavens. 3. Signified Imam Mahdi’s role to defend Islam. 4. It showed the significance of prayer; God had listened to prayers of saints and revered people who had prayed over centuries for Imam Mahdi to appear. 5. All these aspects were proof of the truthfulness of Islam. Bhai Abdul Rahman says all these matters had a deep impact on him and he developed in spirituality. He prayed fervently to find Imam Mahdi. Although young, he would call out for this scared person as he looked for him, at times in wilderness. Eventually he was enabled to fulfil his wish. Sheikh Naseer ud Din Sahib, companion of the Promised Messiah (on whom be peace) was inspired to take bai’at after a dream. He belonged to Ahle Hadith community. His heart bore witness that it was time for the Promised One to come but he had not yet appeared. Once he saw a Maulawi in mosque perturbed and lamenting that the solar eclipse had taken place and people were going to accept Mirza Sahib. Sheikh Sahib could not quite understand why the Maulawi was worried if the eclipse had taken place. Surely it was a joyous occasion. He prayed most earnestly and touchingly for guidance. He had a dream that a huge monster attacks him but he fires at him with a gun and the monster disappears in a puff of smoke. And then he joins a congregational Prayer in a mosque on an elevated spot. This dream was interpreted for him as him overcoming his demons and joining a righteous community. Around this time Sheikh Sahib heard about the Promised Messiah’s claim and he went to Qadian and took bai’at on the blessed hand of the Promised Messiah (on whom be peace). Huzoor announced that after Friday Prayer he would lead funeral Prayer in absentia of Ahmad Yahya Bajwa Sahib who passed away on 11 March in an accident. He was 27 years old and a student at Jamia in Germany. He was a very promising young man with a very humble and charming nature. May God elevate his status.